European leaders rebuffed calls from Ukraine for greater support against Russia on Thursday, after Kiev urged NATO to send ships into waters disputed with Moscow. German Chancellor Angela Merkel asked Kiev to be "sensible" following the request from President Petro Poroshenko, just hours after the European Union failed to agree to threaten new sanctions against Moscow. Kiev has called on Western allies to back expressions of support with concrete action after Russian forces on Sunday seized three Ukrainian ships off the coast of Crimea. The incident was the most dangerous in years between the ex-Soviet neighbours -- who are locked in conflict over Russian-backed separatist regions -- and has raised fears of a wider escalation. In an interview with Germany's Bild newspaper published Thursday, Poroshenko asked NATO members including Berlin to send naval vessels to the Sea of Azov to back his country. "Germany is one of our closest allies, and we hope that states within NATO are now ready to relocate naval ships to the Sea of Azov in order to assist Ukraine and provide security," he said. But, while blaming Russia for tensions, Merkel showed no signs of being ready to back military support. "We ask the Ukrainian side too to be sensible because we know that we can only solve things through being reasonable and through dialogue because there is no military solution to these disputes," she said. Ukraine has also urged Western governments to impose more sanctions on Russia over the incident, but there too it has seen little support. In a statement on Wednesday, the EU strongly condemned Russia's actions but, after three days of debate among senior officials, could not agree on a tougher response. Wednesday's statement reiterated demands that Russia release the seized boats and their crews, and restated Europe's "full support for the independence, sovereignty and territorial integrity of Ukraine". It stopped short of threatening sanctions, saying only that the EU "is determined to act appropriately, in close coordination with its international partners". NATO spokeswoman Oana Lungescu said the issue would be raised at next week's regular meeting of alliance foreign ministers in Brussels, where Ukrainian Foreign Minister Pavlo Klimkin is also expected. She stressed that NATO is already present in the wider region. "Since Russia's illegal annexation of Crimea in 2014, NATO has substantially increased its presence in the Black Sea," she said. Moscow and Kiev have traded angry accusations since Russian navy vessels fired on, boarded and captured the three Ukrainian ships. 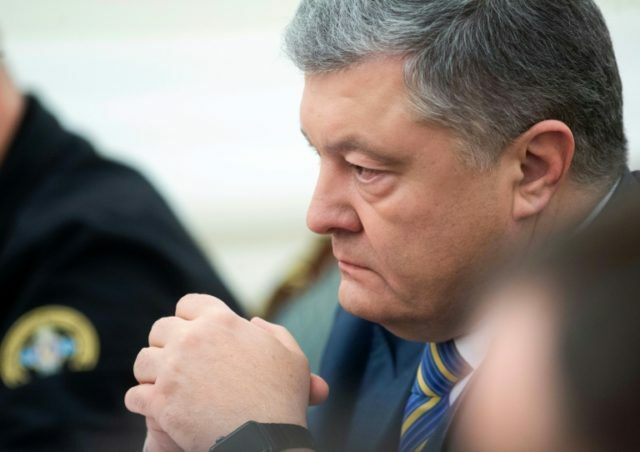 After warning of the threat of "full-scale war", Poroshenko on Wednesday signed an act imposing martial law for 30 days in regions bordering Russia, the Black Sea and the Sea of Azov. Russian President Vladimir Putin insisted Moscow's actions were "lawful" because the Ukrainian ships had crossed illegally into Russian territory. He said the incident was a provocation orchestrated by Poroshenko to shore up public support ahead of a tough re-election battle in a presidential vote set for March. The Kremlin on Thursday also denied claims from Kiev that it was blocking access for Ukrainian ships to the Kerch Strait, the only crossing point between the Black Sea and the Sea of Azov. "I don't know of any restrictions at the moment. On the contrary, as far as we know the Kerch Strait is operating normally," Putin's spokesman Dmitry Peskov said during his daily briefing. Ukrainian Infrastructure Minister Volodymyr Omelyan said on Wednesday that 18 Ukrainian vessels were awaiting permission to pass from the Black Sea to the Sea of Azov. Another nine vessels were waiting in port on the Sea of Azov to pass in the other direction. "Ukrainian ports on the Sea of Azov... are effectively under blockade by the Russian Federation," Omelyan wrote on Facebook. US President Donald Trump late on Thursday called off a planned meeting with Putin at the G20 in Argentina this week over Moscow's detention of the Ukrainian sailors. "Based on the fact that the ships and sailors have not been returned to Ukraine from Russia, I have decided it would be best for all parties concerned to cancel my previously scheduled meeting in Argentina with President Vladimir Putin," he wrote on Twitter. The Ukrainian vessels -- a tug and two gunboats -- were trying to pass through the Kerch Strait from the Black Sea to the Sea of Azov, but were refused access and chased into international waters by Russian vessels. Two of their lawyers said Thursday that the sailors had been transferred to Moscow for holding in the city's notorious Lefortovo prison. German government spokesperson Steffen Seibert reiterated Berlin's position on the situation in the Kerch Strait, stating that the government wants to see "dialogue and caution on both sides." While speaking at a press conference in the German capital on Wednesday, Seibert also added that "a deployment of the German navy toward the Crimea coast is not being planned at the moment," in line with the government's position encouraging de-escalation. Read alsoTurkey could play role of mediator in settling Ukraine-Russia row in Black-Azov seas region "It is in the interest of Germany, it is in the interest of Europe, that Ukraine continue to play a role as a transit state for Russian gas," the spokesman also said amid Ukraine's concerns that the construction of the Nord Stream 2 gas pipeline bypassing Ukraine threatens Ukraine's position of a gas transit state and also threatens the entire European energy security. As UNIAN reported earlier, Ukrainian President Petro Poroshenko called on the European Union to take real steps to stop the "creeping annexation" of the Sea of Azov by the Russian Federation. 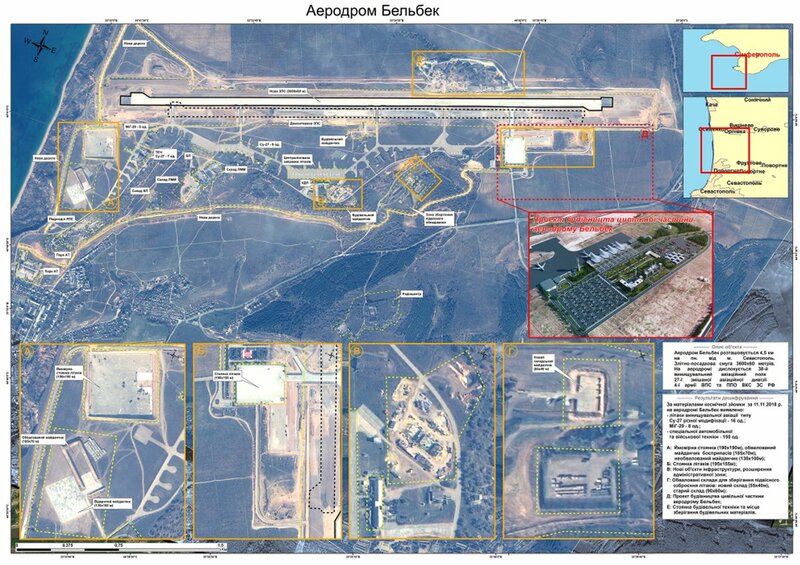 Russia has now deployed nearly 24 combat aircraft, including 16 Su-27s and 8 MIG-29s to Belbek Airfield, #Crimea. US Air Force/Samuel King Jr.An FIM-92 Stinger missile is fired from an Army Avenger vehicle. The Pentagon has been focusing on preparations for a potential clash with a peer, or near-peer, adversary like Russia. Amid heightened tensions with Russia, the US Army in Europe has made a number of changes to how it operates. The most recent change was the return of an air-defence unit stationed on the continent permanently. The US Army in Europe has made a number of changes in recent months as part of a broader effort by the Pentagon to prepare for a potential fight against an adversary with advanced military capabilities, like Russia or China. The latest move came on November 28, when the Army activated the 5th Battalion, 4th Air Defence Artillery Regiment, in a ceremony at Shipton Barracks in Ansbach, near the city of Nuremberg in southern Germany. 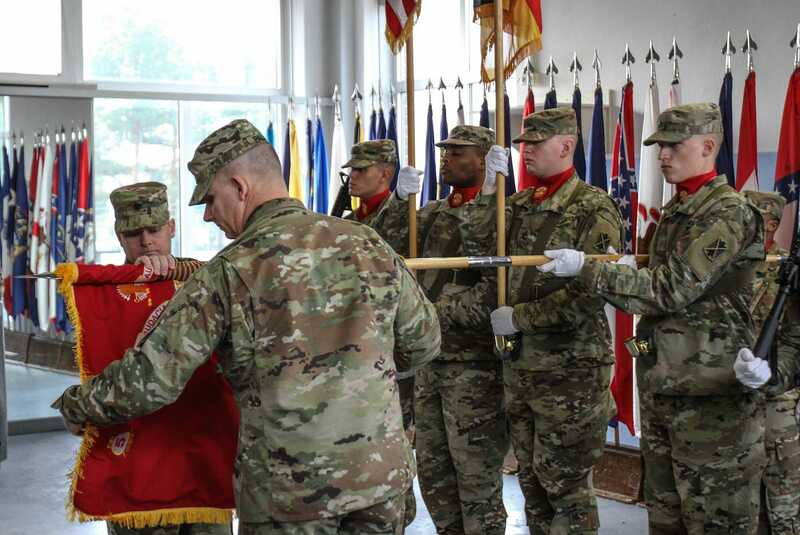 The battalion has a long history, serving in artillery and antiaircraft artillery roles in the War of 1812, the Civil War, World War II, and the Vietnam War. It was deactivated in the late 1990s, after the US military withdrew from the Cold War. US Army/Sgt. 1st Class Jason EppersonLt. Col. Todd Daniels, commander of the 5th Battalion, 4th Air Defence Artillery Regiment, uncovers the battalion colours during the activation and assumption of command ceremony at Shipton Kaserne, Germany, on November 28, 2018. 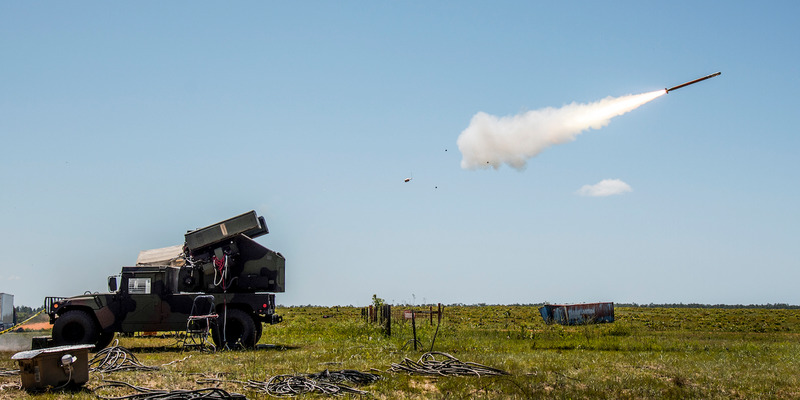 Its return brings new and important short-range-air-defence, or SHORAD, capabilities, according to Col. David Shank, the head of 10th Army Air and Missile Defence Command, of which the new unit is part. “Not only is this a great day for United States Army Europe and the growth of lethal capability here. It is a tremendous step forward for the Air Defence Enterprise,” Shank said at the ceremony. The battalion will be composed of five battery-level units equipped with FIM-92 Stinger missiles, according to Stars and Stripes. Those troops “will have a hard road in from of them,” Shank said. US Air Force/Samuel King Jr.Stinger missiles are fired from the Avenger Air Defence System. Air Defence Artillery units were for a long time embedded in Army divisions, but the service started divesting itself of those units in the early 2000s, as military planners believed the Air Force could maintain air superiority and mitigate threats posed by enemy aircraft. But in 2016, after finding a gap in its SHORAD capabilities, the Army started trying to address the shortfall. 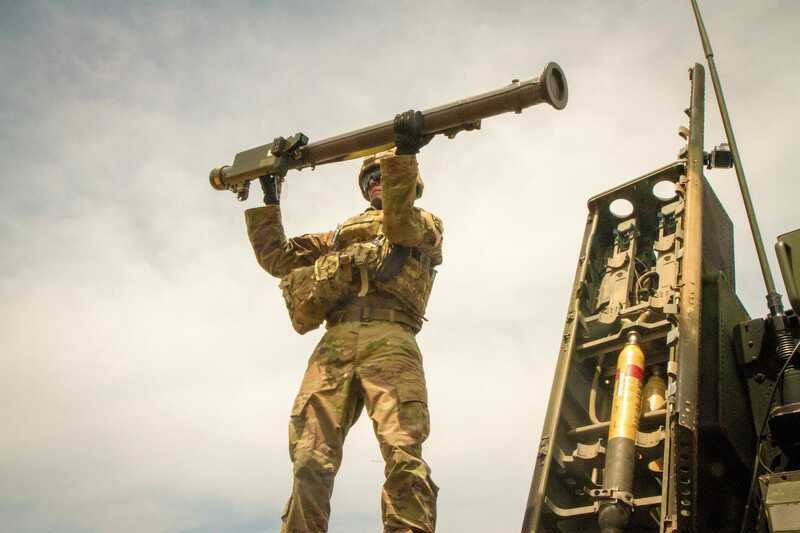 In January, for the first time in 15 years, the US Army in Europe began training with Stinger missiles, a light antiaircraft weapon that can be fired from shoulder- and vehicle-mounted launchers. Lightweight, short-range antiaircraft missiles are mainly meant to defend against ground-attack aircraft, especially helicopters, that target infantry and armoured vehicles. Unmanned aerial vehicles – used by both sides in the conflict between Russia and Ukraine – are also a source concern. US Army/Capt. Rachael JeffcoatA 35th Air Defence Artillery Brigade member loads a Stinger onto an Avenger Air Defence System. 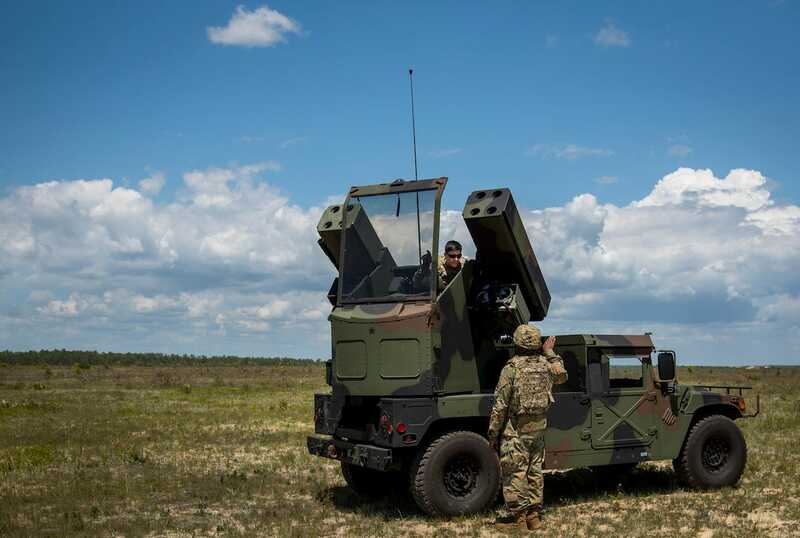 US Army Europe has been relying on Avengers defence systems and Stinger missiles from Army National Guard units rotating through the continent as part of Operation Atlantic Resolve, which began in 2014 as a way to reassure allies in Europe of the US commitment to their defence. Guard units rotating through Europe have been training with the Stinger for months, but the 5th Battalion, 4th Air Defence Artillery Regiment, will be the only one stationed in Europe that fields the Avenger, a short-range-air-defence system that can be mounted on a Humvee and fires Stinger missiles. The Army has also been pulling Avenger systems that had been mothballed in order to supply active units until a new weapon system is available, according to Defence News, which said earlier this year that Army Materiel Command was overhauling Avengers that had been sitting in a Pennsylvania field waiting to be scrapped. Capt. Marion Jo Nederhoed/US ArmyA US Army Avenger team during qualification in South Korea, October 24, 2018. The Army has also fast-tracked its Interim Short Range Air Defence (IM-SHORAD) program to provide air- and missile-defence for Stryker and Armoured Brigade Combat Teams in Europe. The Army plans to develop IM-SHORAD systems around the Stryker, equipping the vehicle with an unmanned turret developed by defence firm Leonardo DRS. 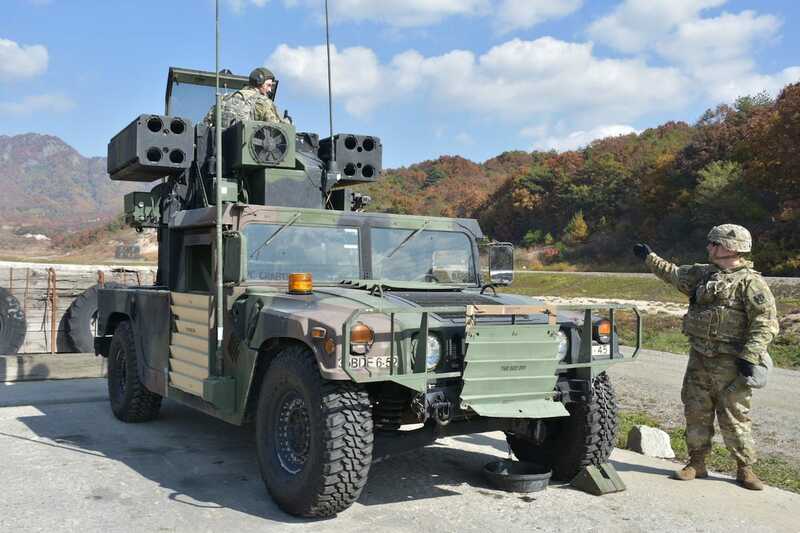 The system includes Stinger and Hellfire missiles and an automatic 30 mm cannon, as well as the M230 chain gun and a 7.62 mm coaxial machine gun. It will also be equipped with electronic-warfare and radar systems. Final prototypes of that package are expected in the last quarter of 2019, according to Defence News, with the Army aiming to have the first battery by the fourth quarter of 2020. 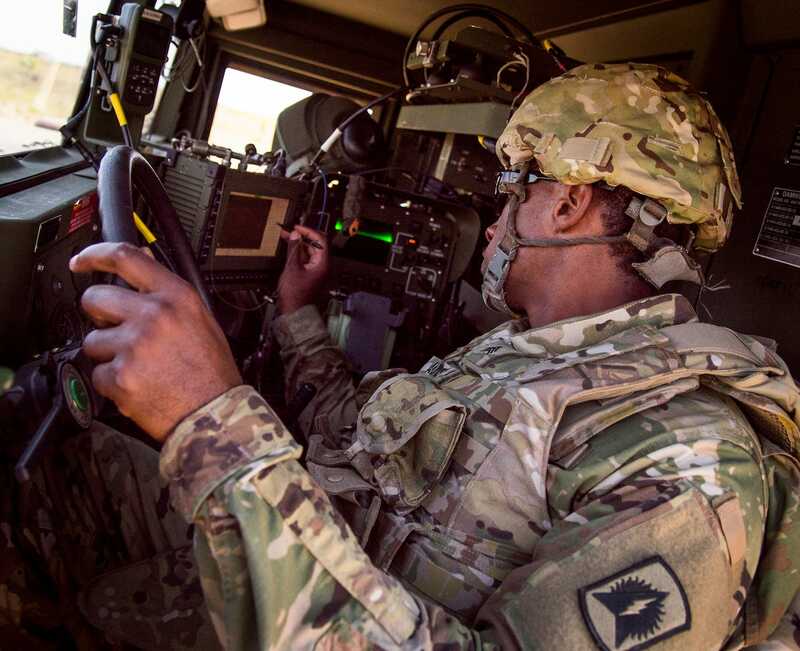 US Air Force/Samuel King Jr.A member of the Florida National Guard’s 3rd Battalion, 265 Air Defence Artillery Regiment, uses a touchscreen from the driver’s seat of an Army Avenger. The activation of the 5th Battalion, 4th Air Defence Artillery Regiment, is part of a broader troop increase the Army announced earlier this year, saying that the increase in forces stationed in Europe permanently would come from activating new units rather than relocating them from elsewhere. In addition to the short-range-air-defence battalion and supporting units at Ansbach, the new units will include a field-artillery brigade headquarters and two multiple-launch-rocket-system battalions and supporting units in Grafenwoehr Training Area, and other supporting units at Hohenfels Training Area and the garrison in Baumholder. The activations were scheduled to begin this year and should be finished by September 2020, the Army said in a statement. “The addition of these forces increases US Army readiness in Europe and ensures we are better able to respond to any crisis,” the Army said. Last edited by vector7; December 1st, 2018 at 06:30. Russia is building up its land forces and weapons along the border, Ukraine's president said Saturday as German Chancellor Angela Merkel warned Russia not to block Ukrainian ports in the Sea of Azov. Tensions between Russia and Ukraine were still escalating a week after a naval clash in the Black Sea on November 25 in which Russia fired on three Ukrainian naval ships then seized them and their 24 crew members. Speaking at a Ukrainian military event, President Petro Poroshenko said Russia has deployed "more than 80,000 troops, 1,400 artillery and multiple rocket launch systems, 900 tanks, 2,300 armored combat vehicles, 500 aircraft and 300 helicopters" along their common border. These numbers, which have not been verified, would account for the vast majority of men and hardware assigned to Russia's Western Military District. The naval clash came as the Ukrainian ships sailed to the Kerch Strait, the only waterway leading into the Sea of Azov and the site of a new key Russian bridge linking occupied Crimea with the Russian mainland. Russia accused the Ukrainian vessels of violating Russian territorial waters, a charge Ukraine has denied. Ukrainian officials say Russia has now imposed a de facto blockade on its two main ports in the Sea of Azov by allowing only ships destined for Russian ports through the strait. Merkel criticized that Russian move, speaking to reporters Saturday on the sidelines of the Group of 20 summit in Buenos Aires after holding a bilateral meeting with Russian President Vladimir Putin. "Free shipping into the Sea of Azov to the Ukrainian coast and harbors must be ensured" by Russia, she said. A 2003 Russia-Ukraine agreement designates the Sea of Azov and the Kerch Strait as shared internal waters. But following Russia's 2014 annexation of Crimea, Moscow has asserted greater control over the passage. "The Kremlin is further testing the strength of the global order," Poroshenko said Saturday, alleging that Moscow is waiting to see whether the international community will allow Russia to assert that the Sea of Azov and Black Sea are Russian territorial waters. Poroshenko said Russia is also increasing its presence at sea. "In the waters of the Black Sea, Sea of Azov, and Aegean Sea, more than 80 ships and 8 submarines are on patrol — including 23 combat vessels and 6 submarines," he declared. In response to the seizure of the ships, Poroshenko convinced the Ukrainian parliament to implement martial law in ten border regions. Many in Ukraine and abroad have criticized the martial law order, noting that playing up the Russian threat is politically beneficial to Poroshenko, who faces re-election in March. The martial law order included a ban on entry to Ukraine of all Russian males aged 16 to 60, a move Poroshenko said is designed to prevent undercover Russian military units from infiltrating the country. Poroshenko said this tactic was used after Russia seized Crimea and began to support separatist rebels in eastern Ukraine, sparking a conflict that has left more than 10,000 people dead. An unsteady cease-fire has been in place there since 2015. The Ukrainian border service said Saturday that around 100 Russian citizens had been denied entry since the border restrictions went into effect Friday. "The vast majority of (them) could not confirm they purpose of their trip to Ukraine," Ukrainian border guard spokesman Andrei Demchenko told Ukrainian television on Saturday. On November 25, two Ukrainian gunboats, together with a tug, attempted to cross from the Black Sea through the Kerch Strait into the Sea of Azov, where Ukraine controls two major port cities—Mariupol and Berdyansk. The Ukrainian convoy was stopped by Russian Federal Security Service (FSB) Border Guard ships, even though both Moscow and Kyiv agree the Ukrainian vessels had the right to cross into the Azov Sea in accordance with a 2003 treaty that declared these waters a joint sovereignty “internal” waterway (see EDM, November 26, 28). Nevertheless, Moscow accused Kyiv of ignoring protocol in applying for passage. After a multi-hour standoff just outside the Kerch Strait, the Ukrainian convoy turned back to Odessa since the small shallow-water Gurza-M-class gunboats have a crew of only five and are limited to just five days of autonomous voyage. Yet, the Russian forces did not allow them to withdraw peacefully and attacked, purposefully ramming the tugboat and using live munitions after a demand to stop engines was ignored. The Berdyansk gunboat was hit multiple times by heavy machinegun fire and apparently by armor-piercing rockets fired from a Ka-52 helicopter gunship and an Su-30 jet. The Berdyansk’s crew was lucky to survive unscathed. The three Ukrainian ships surrendered and were boarded by Russian commandos. Twenty-four Ukrainian service members were apprehended and the ships impounded (Interfax, November 27; Fakty.ua, November 29). Gurza-Ms are river gunboats with some coastal sea operational capabilities. They have two gun turrets originally designed for a Ukrainian-made BM-3 armored vehicle. Moreover, these vessels are equipped with a 30-millimeter automatic gun, a grenade launcher and laser-guided Ukrainian-made Baryer-VK anti-tank missiles. The Gurza-M’s armor can withstand 7.62-mm bullets. Ukraine began building these gunships as a cheap alternative after 2014, when it lost almost its entire fleet during the annexation of Crimea. The Ukrainian Navy has already moved several Gurza-M boats to the Sea of Azov this year and announced plans to establish a military naval base in Berdyansk, citing increased Russian military threats (RIA Novosti, November 16). The passage of two more gunboats may have annoyed the Russians; but on their own, those two small craft could not have possibly flipped the balance of military power in the Sea of Azov. Still the Russian military went berserk, fired to kill, and captured ships that did not seem to pose any immediate threat. Moscow accuses Kyiv of deliberately “provoking” a confrontation with Russia, adding that the European Union and the United States are guilty of “coordinating the provocation of a confrontation.” In a special statement, the Russian Ministry of Foreign Affairs warned Ukraine and the West of “grave consequences” that may follow (Militarynews.ru, November 26). Ukrainians are seen in Moscow as proxies doing the bidding of their Western masters and “sponsors.” The Russian defense ministry’s (General Staff’s) threat assessment apparently implies that a future Ukrainian naval base in the Sea of Azov could eventually become a deployment point for Western—that is North Atlantic Treaty Organization (NATO)—ships and forces much better equipped than the small Gurza-M gunboats. Although, those Ukrainian vessels could still play a vital role in guarding this base against Russian commando infiltration. The Azov Sea is mostly extremely shallow: Russian submarines and warships of the Black Sea Fleet cannot operate there effectively, while the US and its allies have some modern well-armed warships capable of operating in the coastal littoral. Ukrainian President Petro Poroshenko has called on NATO to deploy forces to the Azov Sea to counter Russian aggression. The Kremlin insists this would be an extremely negative development (Interfax, November 29). The fact that no NATO member is presently planning to send any ships to the Azov Sea—not even a short friendly visit—will hardly calm the Russian nightmare assessment of the West suddenly achieving naval superiority there. Russia has been constantly using the Sea of Azov and the Kerch Strait to move corvettes armed with long-range Kalibr cruise missiles (potentially nuclear tipped) from the Caspian Sea through the Volga, the Volga-Don channel, the Sea of Azov, the Kerch Strait, the Black Sea, the Bosporus, into the Mediterranean and then back again. These corvettes have been shooting Kalibr missiles at Syria from the Caspian and from the Mediterranean. To attack any other targets in the larger Middle East, the Russian corvettes may use the rear position in the Caspian; to go after targets in the West, a deployment in the Black Sea or Mediterranean is essential. A NATO-backed Ukrainian naval base in Berdyansk or Mariupol could thus seriously impede Russian naval operational plans, Moscow seems to believe. The fear of a Western-led conspiracy against vital Russian interests in the Black and Azov seas may explain the extreme Russian reaction. The 24 Ukrainian service members were denied prisoner-of-war status, apprehended on criminal charges, and at least some of them reportedly moved to Moscow to the notorious FSB Lefortovo prison, apparently to be interrogated to seek evidence of a possible extended conspiracy (Interfax, November 29). US President Donald Trump has, in turn, canceled at short notice a preplanned meeting with President Vladimir Putin in Buenos Aires, at the G20 summit, because of the continued detention of the Ukrainian sailors and the Russian actions on November 25 (Interfax, November 29). This cancelation will be seen in Moscow as a nasty snub, but also possibly as additional conformation of a Western-led conspiracy surrounding the Azov Sea. After the naval skirmish, Poroshenko, supported by a majority in the parliament declared 30 days of martial law in regions bordering Russia. Poroshenko, quoting Ukrainian military intelligence, insists martial law will allow the country to raise its battle readiness and prepare the nation to face a possible Russian invasion aimed at occupying the port cities of Mariupol and Berdyansk and removing Ukrainian forces from the Azov shoreline (Militarynews.ru, November 26). This threat assessment may be real: By pushing back the Ukrainian forces and, say, handing the Azov shoreline to the Russian-backed Donbas separatists, Moscow solves the alleged Sea of Azov vulnerability problem while, at the same time, possibly securing a land corridor from Russia to Crimea. The Russian military has announced a “division” of S-400 missiles has been urgently deployed at Dzhankoy, in northern Crimea—a strategically important crossroads, where the main rail and highway connecting Crimea with Moscow traverse the salty Sivash marshes that form the Western tip of the Sea of Azov. At present, opposite Dzhankoy, the Ukrainian border guards control the north end of the main bridges to Crimea at Chonhar (Interfax, November 29). This map here you can see #Russia clearly could stop #Ukraine from being able to call in it's Airforce or naval forces to stop any attack on #Mariupol or #Berdyanks. This gives the Russians a major strategic advantage if they launch any attack in Eastern Ukraine. KIEV, Ukraine — Russia is building up its land forces and weapons along the border, Ukraine's president said Saturday as German Chancellor Angela Merkel warned Russia not to block Ukrainian ports in the Sea of Azov. “SMM long-range unmanned aerial vehicle (UAV) spotted six MLRS (BM-21 Grad, 122mm) at a training area near Miusynsk (62km south-west of Luhansk) eight MLRS (BM-21) near Sadovyi (57km south-west of Luhansk), and 22 MLRS (BM-21) near Bokovo-Platove (54km south-west of Luhansk),"
Military units are to be deployed as part of martial law as Kiev responds to Russia seizing its navy ships and their crews. Ukraine's president has called-up army reservists to strengthen its defences over fears of a Russian invasion. Petro Poroshenko said reservists will be summoned for training as part of the martial law he declared at the end of November. He said that some military units will be redeployed to strengthen the nation's defences in a ratcheting up of tensions between the neighbouring countries. "Ukraine is taking its own steps in response to the threat of a large-scale Russian invasion," the president said. He also called on Germany and its allies to boost their naval presence in the Black Sea to deter futher Russian aggression.Martial law was declared in parts of Ukraine on 26 November, a day after the Russian coastguard fired at and seized three Ukrainian naval vessels and 24 crew members off the Crimean Peninsula that Russia annexed from Ukraine in 2014. The Kremlin said Mr Poroshenko's latest announcement is an "absurd" attempt to inflame tensions. As part of the 30-day martial law, all Russian males aged 16 to 60 have been barred from entering Ukraine, a move which Mr Poroshenko said was needed to prevent Russia further destabilising his country.Over the weekend Mr Poroshenko said that Russia deployed a large number of troops along its border, and claimed the Kremlin intends to push into Ukraine. His government also accused Russia of blockading its ports in the Sea of Azov - which the Kremlin denies.Russian President Vladimir Putin's spokesman, Dmitry Peskov, said Ukraine's claims were an "absurd attempt to foment tensions". "The accusations against Russia have no basis whatsoever," he added. However, the Russian military said its forces in Crimea were conducting drills involving Bal and Bastion long-range anti-ship missile systems.The sailors taken from the Ukrainian ships in November by Russia have been placed in custody for two months as Russia investigates the clash in the Kerch Strait, which links the Black Sea and the Sea of Azoz. Ukraine and Russia have blamed each other for the naval incident which ramped-up sour relations created in 2014 when Russia annexed Crimea and backed separatist rebels in eastern Ukraine. Kiev says its ships were in international waters while Russia claims the boats were violating its borders. Mr Poroshenko has said he tried to arrange a phone call with Mr Putin to discuss the standoff but was refused. The Russian leader's spokesman said "no such conversation is planned".The UK does not currently have a presence in the Black Sea but Defence Secretary Gavin Williamson said Ukraine was a "steadfast partner" and that Britain would continue to carry out joint training programmes and military exercises. NATO Secretary-General Jens Stoltenberg holds a news conference after a meeting with the ambassadors at the Alliance headquarters in Brussels, Belgium, Nov. 26, 2018. LONDON — Russia’s recent attack on Ukrainian naval vessels will likely top the agenda at a NATO meeting this week as the alliance searches for a robust response in the wake of the Kremlin’s latest act of aggression on Europe’s borders. U.S. Secretary of State Mike Pompeo is scheduled to join other foreign ministers for the two-day meeting in Brussels starting Tuesday, where American demands for more military spending from NATO allies will also be discussed. Attending a ceremony to mark the acquisition of new military hardware Saturday, Ukraine’s president urged allies to step forward.​“This is an enormous threat and together, with our allies, we are searching for an appropriate response to it,” President Petro Poroshenko said. The Ukrainian leader wants NATO to send warships to the Azov Sea, which is supposed to be shared between Moscow and Kyiv under a 2003 agreement. Ukraine says Russian warships have blockaded the Kerch Strait off Crimea – the territory it forcibly annexed in 2014 – effectively cutting off Ukrainian Black Sea ports. NATO is under pressure to offer a robust response at Tuesday’s foreign ministers’ summit. But speaking last week, NATO Secretary-General Jens Stoltenberg gave no indication that the alliance is prepared to risk a naval confrontation with Russia.“We call on Russia to ensure unhindered access to Ukrainian ports and allow freedom of navigation for Ukraine in the sea of Azov and Kerch Strait,” Stoltenberg told reporters. Following the incident in the Azov Sea, U.S. President Donald Trump cancelled a planned meeting with his Russian counterpart Vladimir Putin at the G20 summit. Along with military spending, NATO foreign ministers will also discuss Ukraine and Georgia’s ambitions to join the alliance. Georgia’s new President-elect Salome Zurabishvili has already staked out a tough line on Russia, describing it as an "unpredictable occupying power" – and vowing to push forward her country’s bid to join NATO. “We can ask and we've been doing that - membership and that is our direction without any alternative - but on that road we can get much more concrete steps and I intend to be more demanding partner for Europeans as well as with our NATO partners,” Zurabishvili told the Reuters news agency. Foreign ministers are also due to discuss Operation Resolute Support in Afghanistan, in which about 16,000 personnel from 39 NATO member states and partner countries are involved in training and assisting Afghan forces. U.S. Navy regularly sails into the Black Sea to conduct exercises with NATO members Romania, Bulgaria and allies Georgia and Ukraine. They also frequently port on RO ports (supply and Aegis mission). This deployment is likely scheduled in advance. Today, I called both President Vučić and Mr Haradinaj to brief them on the outcome of Wednesday's meeting of NATO Foreign Ministers on the Western Balkans. I underlined that both Belgrade and Pristina should show calm and restraint, and avoid any provocative statements or actions. I also spoke with President Vučić on the need to de-escalate current tensions. I reminded both that the EU-mediated dialogue between Belgrade and Pristina remains the only way to bring durable peace and stability to the region. NATO remains committed to the security and stability of Kosovo through our UN-mandated KFOR peacekeeping mission. Ukrainian soldiers move to position in a APC during military drills in base Honcharivske, Chernihiv region, Ukraine, Monday, Dec. 3, 2018. MINSK, Belarus — The Ukrainian parliament on Thursday voted to withdraw from a wide-ranging treaty on friendship with Russia, the latest step in escalating tensions between the two neighbors. The Supreme Rada overwhelmingly supported a motion by President Petro Poroshenko not to prolong the treaty when it comes up for renewal in April. The camouflage-clad president on Thursday visited an air base to announce an upcoming dispatch of troops to the Russian border. The long-simmering conflict between Russia and Ukraine that started with Russia's annexation of Crimea in 2014 spilled into the open on Nov. 25 when the Russian coast guard fired upon and seized three Ukrainian naval vessels and their crews. The seamen are still in Russian captivity. Ukraine's foreign minister on Thursday reiterated his country's call for the release and safe return of the 24 Ukrainian sailors. Pavlo Klimkin in a speech at the Organization for Security and Cooperation in Europe warned that since the Crimean annexation Russia has not pulled back but, on the contrary, has extended operations into the Black Sea and the Sea of Azov. With the Ukraine-Russia conflict at the top of the OSCE agenda, the EU's high representative Federica Mogherini on Thursday also called on Russia to release the Ukrainian ships and soldiers "without delay." Poroshenko responded to the standoff by introducing martial law for 30 days, something Ukraine hadn't done even after Crimea's annexation and amid large-scale fighting between Ukrainian forces and Russia-backed separatists in 2014-2015. Poroshenko in an opinion piece published in The New York Times on Thursday called on the West to respond to what he described as Russia's aggression by imposing additional sanctions on the Kremlin. "Our common task is not to allow Russia to spill its aggression into the Sea of Azov," he said. "While the West is speaking, Mr. Putin is acting. It is time to respond." Poroshenko on Thursday visited a military air base in the city of Zhytomyr where Ukraine's Air Assault Forces troops were preparing to leave for the locations on the border with Russia "in order to strengthen our defense capabilities and be ready to stop the aggressor without losing a second." The Ukrainian parliament on Thursday voted not to prolong the friendship treaty with Russia, which is up for renewal next April, and adopted a bill that unilaterally doubles the extent of Ukraine's territorial waters to 24 nautical miles. Ukrainian authorities say this will allow the coast guard and the navy to be more efficient in patrolling the area to prevent military threats and smuggling. The bill also allows Ukrainian border guards to open fire without warning on potential attackers. Large alert air defence exercise going on in Russian Western and Southern Military Districts. Reports of units moving and conducting simulated launches from many areas. Pentagon: "Today, the United States and Allies conducted an extraordinary flight under the Open Skies Treaty. The timing of this flight is intended to reaffirm U.S. commitment to Ukraine and other partner nations." Ukraine parliament gave authority for marine border guards to open fire without warning to protect sea areas. WW4 File: UKRAINE-RUSSIA WAR: Ukraine’s top general, Viktor Muzhenko, interviewed by Reuters on Dec. 4, validates earlier statements by President Petro Poroshenko, says threat of Russian invasion “highest” since Crimean takeover in 2014, displays satellite images that reveal presence of Russian T-62M tanks stationed 11 miles from Ukrainian border, number more than doubled from 93 to 250 from Sep. 15 to Oct. 1, Muzhenko: “In front of us is an aggressor who has no legal, moral or any other limits. “Extraordinary” US surveillance flight over Ukraine as Russia builds up its forces . . . nothing to see here folks. No need to worry about nuclear war or anything like that . . .
Last edited by vector7; December 7th, 2018 at 01:44. Reason: Adding more content. Washington (CNN) The US has begun making the necessary preparations to sail a warship into the Black Sea, a move that comes amid heightened tensions in the region following Russia's seizure of Ukrainian ships and detention of Ukrainian sailors. A State Department spokesman said, "the United States carries out its activities consistent with the terms of the Montreux Convention. We will not, however, comment on the nature of our diplomatic correspondence with the Government of Turkey." "We routinely conduct operations to advance security and stability throughout the US 6th Fleet area of operations to include the international waters and airspace of the Black Sea," Raines told CNN. "We reserve the right to operate freely in accordance with international laws and norms," he added. On Wednesday, the US Navy sailed the guided missile destroyer USS McCampbell near contested waters in the Sea of Japan Wednesday, an action that is bound to irk Russia. The US warship conducted what the Navy refers to as a "Freedom of Navigation Operation" to push back against Russian claims on the waters. A spokesman told CNN Wednesday that Moscow lays claim to areas that far exceed the 12 miles from the Russian coastline that is guaranteed by international law. Ukraine’s Ambassador to the United Nations Volodymyr Yelchenko revealed on Thursday that Russia has deployed nuclear weapon carriers in Crimea. Speaking on a security briefing on the Black Sea and the Sea of Azov region, Yelchenko said that Moscow has tightened its military grip over the area, which it illegally annexed back in 2014 amid civil unrest against the Ukranian government. The Crimean peninsula separates the Sea of Azov from the Black Sea. The opening in the Black Sea that leads to the Sea of Azov, the Kerch Strait, is where Russian troops illegally rammed and seized three Ukrainian ships in late November, triggering an international outcry. Yelchenko went on to explain how Russia may be preparing for the complete re-nuclearization of Crimea, an idea that would raise alarm among international peacekeepers. 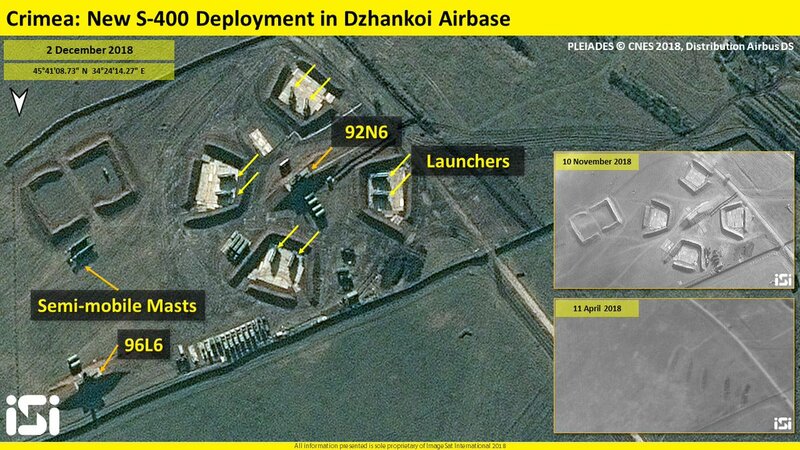 Yelchenko’s claims follow a Fox News report this week showing the deployment additional S-400 surface-to-air missile batteries at a Crimean airbase, days after the confrontation between the Russian military and Ukrainian navy ships after they attempted to enter the Sea of Azov. The incident, as well as the continued military build-up, has raised fears that Moscow may be intending to invade Ukraine, although Russian President Vladimir Putin has played down such speculation. Putin warned this week of an arms race with the United States after Secretary of State Mike Pompeo issued a 60-day ultimatum for Russia to correct its “material breach” of the joint nuclear treaty signed during the Cold War. Russia Could Overrun The Baltic States In THREE DAYS: US War Planners Say. Hungarian Foreign Minister Peter Szijjarto delivers a statement during the Geneva Conference on Afghanistan, at the European headquarters of the United Nations in Geneva, on Nov. 28, 2018. “Hungary is standing up in support of Ukraine’s territorial unity and independence but is monitoring Ukraine’s minority-affecting politics. Assuring the rights of minorities is part of security and stability. Hungary can only withdraw its veto [on the Ukraine-NATO commission’s session] in one case: if the Ukrainians take the required action in the interests of restoring to the Hungarian community living on its territory the rights to which they are due in accordance with bilateral agreements and international law. The ball is on Ukraine’s court”, Szijjártó said in a statement on Dec. 4. Last edited by vector7; December 9th, 2018 at 00:05. Dawn is here, no russian infiltration attempt on our sector. Only shelling with mortars including heavier 120mm and the flares. Normal exchange of fire, there is no escalation on the battlefield yet. The russian terrorists are planning to escalate soon, keep eyes open! Last edited by vector7; December 11th, 2018 at 07:26. 2 Ukrainian soldiers were killed by #Russia's forces in eastern #Ukraine yesterday. One of them was Viktor Kuropyatnik, born 1973, from Kirovograd oblast. BRUSSELS (Reuters) - NATO will supply Ukraine’s military with secure communication equipment this month, its head Jens Stoltenberg told President Petro Poroshenko at a meeting on Thursday called to discuss an escalation of Kiev’s conflict with Moscow. Stoltenberg praised Ukraine’s “calm and restraint” after Russia seized of three its naval vessels and their crew off Crimea last month. 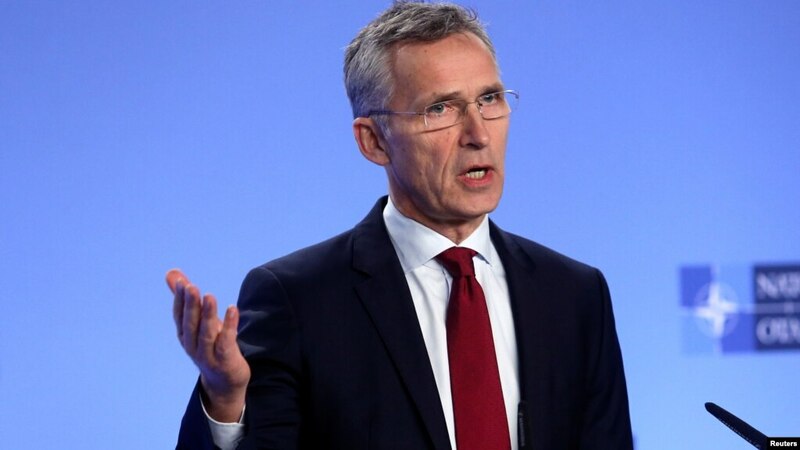 Part of a 40 million euros ($46 million) pledge by the Western military alliance to strengthen Ukraine’s armed forces, Stoltenberg said the secure communications equipment would be delivered by the end of the year. The NATO chief reiterated support for the former Soviet nations’ aspirations to join the alliance - a plan which Moscow vehemently opposes. Russia is resisting international calls to release the ships and men seized in the Kerch Strait, which controls access to the Sea of Azov near the Crimea region that Moscow annexed from Ukraine in 2014. “Ukraine invites allies to come up with comprehensive, tough measures to respond to Russia’s actions,” Poroshenko told reporters at a joint briefing. EU leaders will discuss Ukraine and Russia over a summit dinner later in the day. The bloc’s leaders are expected to offer Ukraine help for regions affected by Russia’s actions in the Azov Sea but stop short of imposing further sanctions on Russia, something sought by more hawkish governments. WASHINGTON (Reuters) - There will be no meeting between U.S. President Donald Trump and Russian President Vladimir Putin while Russia still holds Ukrainian ships and sailors seized near Crimea, U.S. national security adviser John Bolton said on Thursday. “I don’t see circumstances in the foreseeable future where such a meeting could take place until the ships and the crews are released,” Bolton told reporters at a Washington think tank. Russia seized three Ukrainian navy vessels and their combined crew of 24 last month off the coast of Russian-annexed Crimea and accused them of illegally entering Russian waters. Ukraine has said Russia captured the two small gunboats and one tugboat illegally and accused Moscow of military aggression. (Reuters) - European Union leaders will reaffirm support for Ukraine in its standoff with Russia and their readiness to increase aid to the country at a summit on Thursday, the bloc’s foreign policy chief said. The EU’s 28 heads of state will offer Ukraine help for its regions suffering after Russia seized three of its naval vessels and their crew off Crimea last month, a draft summit statement seen by Reuters showed. The Ministry of Foreign Affairs (MFA) of the Russian Federation has once again threatened Ukrainian diplomats working in Russia, arguing that Kyiv is failing to ensure safety of Russian diplomats in Ukraine. "The Myrotvorets website continues operating as Kyiv simply ignores the international community's demand to close down the said resource, which in the public consciousness became firmly associated with the death lists. Two Russian diplomats working in Ukraine have been recently added to the database, which threatens their security," spokesperson for Russia's Foreign Ministry Maria Zakharova told a briefing in Moscow, according to an UNIAN correspondent in Russia. She called on the Ukrainian authorities to strictly comply with the provisions of the Vienna Convention on Diplomatic Relations of 1961 regarding the protection of employees of diplomatic and consular missions. "I would once again like to say that we are not just voicing the warning – we have the opportunity to respond to such things and I'd like to say that this will be done if measures are not taken related to the security of Russian diplomats," Zakharova said. "Kyiv should understand that they have gone too far in playing with things as regards Russian diplomatic missions and Russian diplomatic corps. They won't get away with this," she said. I struggle to follow but isn't this meeting something that the separatist leaders claimed could be targeted? said that this could be the spark that gets this conflict rolling. Yeah that is what I feared.